If you don't receive any e-mail with your access data, please make sure that you have already registered yourself in the shop system. As soon as you are registered, you can login with your e-mail address and your password. A "must-have" in the natural hair care. Pracaxy oil is cold pressed from the seeds of the pracaxy tree in the Amazonian Brasil. The oil is just filtered to separate physical impurities but is not refined . 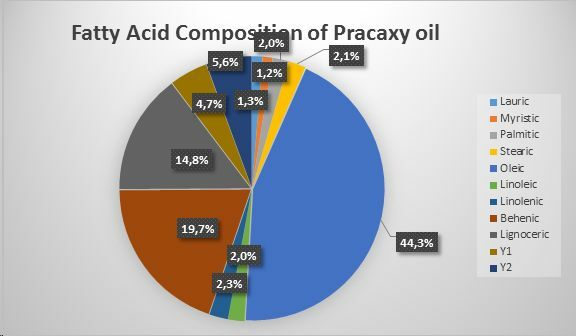 Pracaxy oil is traditionally applied against snake bite and as an insecticide, for wound-healing, against infections and specially in hair care. Because of its high concentrations of behenic and lignoceric acid, the oil feels greasy and heavy over skin and should be applied only in low concentrations and in combination with lighter oils. In hair care, it is applicable (low concentrations) in all kind of hair care preparations from creamy shampoos to hair conditioners and leave-on milks and creams. It adds shine, increases combability and reduces fly-away and acts as a detangler. In skin care, it is applied in reperative and regenerative products for sensitive, damaged and mature skin. It is specially recommendable for preventiing stretch marks. the oil has a melting point of around 20 degrees. It has a golden-greenish colour in liquid form but looks beige/white in solid state. 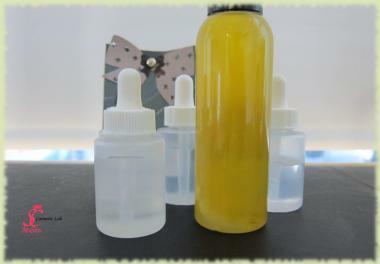 We deliver this oil in bottles to avoid any mess during transport. Depending on the ambient temperature of your lab, you may need to heat the oil gently in a water bath. Like all other plant oil, it might sediment during storage without any damage to the quality of the oil. Heat it gently and shake it for a uniform distribution before application.